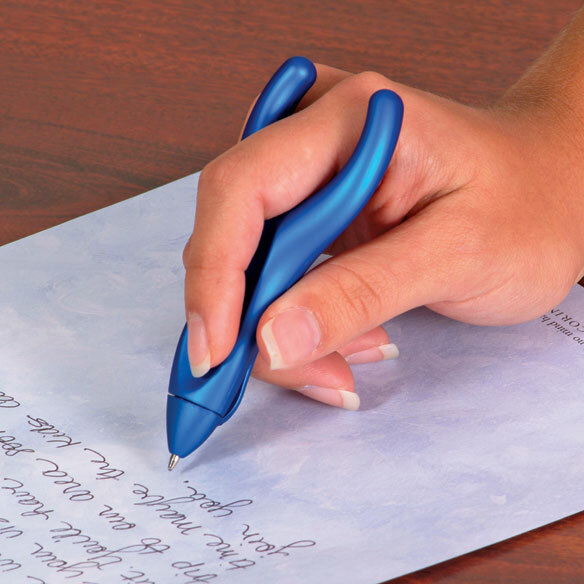 PenAgain™ ergo soft writing instrument takes the pressure off thumb and fingertips. Soft ergonomic pen gives relief for arthritic hands. Ink is odorless; 4"L ink pen includes 2 refill cartridges. I've purchased this pen twice for my father. sometimes pen needs to be positioned straight up in down if grip is loose. it's harder to hold this way. THNAKS FOR A GREAT PRODUCT. I've been looking for this type of pen for awhile. I am in a cast with a broken right wrist and this pen is awesome! I can write checks, sign my name and take readable notes at home and work. Not perfect but readable. I expect it will be an even bigger help after my cast comes off and my hand and wrist are rebuilding strength. Today I brought it to my Orthopedic surgeon's office and everybody on staff wants one! I highly recommend this pen for hand, wrist or arm issue. My hands are getting so crippled that I needed something so I could write well enough for others to read. This pen fits my hand so comfortably without undue pressure. The ink is perfect for use on documents. This pen is a life saver!!! This pen is a lifesaver. I have more control when writing with this pen than any other. When others see me using this pen they always ask to feel, how to use it, and where I got it. The last time I bought one I actually ordered 4-5. I never want to run out of this pen. I am curious to know if it could ever be made in red with red ink! My husband has als and his writing is awful. This pen really helps him. My hands have had some joint fusions due to advanced arthritis, and I have difficulty holding straight pens, even the large barrel ones. This pen takes a little time to get used to writing with it, but I really appreciate it now. I am ordering more of them because my husband wanted to end my frenzy when I can't find my lone pen. My pen didn't come with refills, so I'm glad this one does. I love these pens! They are great for my arthritic hands. The only wish I have is that the refills are available separately. I don't want to throw these good pens away because I run out of refills. Can's I buy those separately so I can use the great pens over and over again. I now have 3 pens and I want to use them the rest of my life! I had my joints in my thumbs replaced, I can now write with better grip. Sometimes my hand shakes and this pen helps me guide my writing. I like the way it feels when writing and that is the reason for trying it out. I had to do some online research because it was getting very difficult to write. With numerous health issues including Psoriatic Arthritis, there are always so many papers to fill out. I was using big pens, but they were not comfortable to hold. This pen is excellent, it is like an extension of my hand and I have not dropped it once! I have Multiple Sclerosis and I am weak on my right side and it is very difficult for me to sign my name using a traditional pen. I have tried using fat pens and adding grips to pens to make them easier to hold but I still can't comfortably use a pen to legibly write my name. After getting this pen I am able to sign my name, balance my checkbook and write more legibly than I have in a long time. I am so happy to have found this pen. It has made things a little bit easier for me. Thank you. I bought this for my son who was injured in an accident and is having to learn how to use his left hand to write. It is easy to hold and control. Easy on my arthritis fingers. Very comfortable to use. This pen takes a little time to get use to because it's a whole new hold, yet so worth while. My fingers do not lock up now when writing a long report. It is easier for my grandchild that has some difficulty with fine motor control. Those of us with myasthenia and carpal tunnel have difficult writing clearly and comfortably. These pens our a large aid. With arthritis, I find writing difficult and messy. This has greatly improved my writing. Had a hard time figuring how to open point. Don't use it every time-just when I want to try it again and have need to read my writing! NOT work for me. money wasted. Purchased for someone who has difficulty writing due to weakness in the hand. I hope it helps. My husbands hands shake and this will help steady them. I have a hard time writing because I have MS.
Will make it easier to write. I've used this pen before and liked it when I was writing a lot - very comfortable. My dad has found this to be a great pen when he's having trouble holding other pens. The therapist also likes it, so I bought her one. My mother has tremors and she can't write. Thought she could be independent with it. My peripheral neuropathy makes it very difficult to hold most pens. I am hoping this pen will enable my Mother to write easier. Unable to write with regular pen. This is a pen that I've used in the past; been through three of them and haven't been able to find new ones for years. Fortunately a friend saw it in the Easy Comfort catalog, thought of me and how bummed out I was that I hadn't been able to find it any more. He fortunately and promptly informed me about it. Please keep them in stock! I have a family member who needs assistance writing. It is getting more difficult for me to write. Hopefully this is help. We have a friend who has problems with her hands & thought this might help her. In the hope that I could at least print legibly again. because my cursive needed help. this provided it. I think it will help me write easier, because of the problems with my hands. Should help a lot with writing checks and all. Have a hard time holding a pen due to carpel tunnel. Hoping this will help. Chose for a friend who has difficulty holding a pen. I have gotten R/A in my fingers and I am hoping this will help with my writing. My husband has developed tremors. This pen seems like the best thing for him. her patient notes her hand is painful. If you have bought this pen, Do you know if after you use the 2 refills that come with it, if you can find more refills to purchase or do you have to throw the pen away? Thanks Carlene, I'll get some too. Laura B. Where can I get refills for PenAgain? BEST ANSWER: Thank you for your question. Unfortunately we do not sell the refills. 2 refills come with the item when ordering. We hope this information will be of help to you. Is it retractable, or have a cap? Thank you for your question. This pen is retractable, but has no cap. 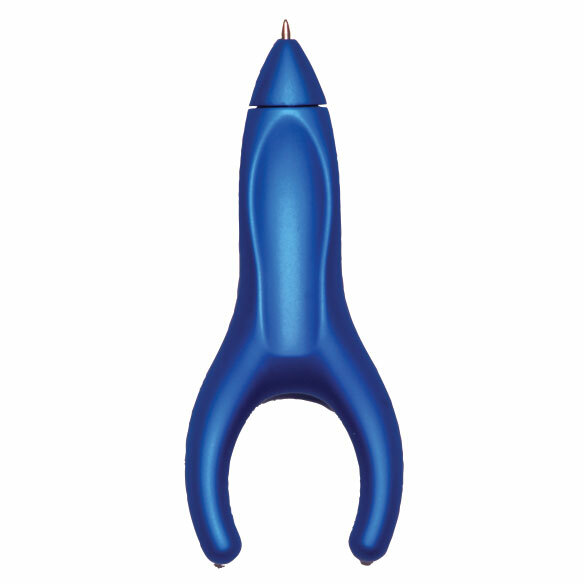 Yes, the pen is retractable and comes with a clip. can i get it with red ink? BEST ANSWER: Thank you for your question. We only carry the pen with black ink. We hope this information will be of help to you.